We’re surviving the below zero temperatures here in Maine by channeling our inner thru-hiker. Well, it was never -10 with a windchill that made it feel -25 while we were hiking the trail, but when we had to shovel outside and our fingers and toes started to go numb, we knew warmth was only steps away in our apartment. We’ve most definitely gained perspective these past few months. Let me backtrack a month and update you all on what’s going on in our ever-influenced by thru-hiking life. In mid-December, we were fortunate enough to give two more presentations in our hometown. On a cold, Monday morning we gave an hour-long presentation to about 350 high school students at the high school and then another shorter presentation in the afternoon to 5th through 8th graders at the middle school. We had a great time sharing our hike with so many kids at the schools. We started off by showing our video and jumped right into what it’s like to thru-hike the Appalachian Trail. We made sure to leave plenty of time for questions and even had some kids try on Miles’ pack. Sometimes, it can be hard to tell what an audience thought about what you just presented to them. But when high school teachers came up to us afterwards and say that they couldn’t remember anyone ever coming in for a presentation and holding every single student’s attention for over an hour, we knew that we had accomplished what we set out to do that morning. One student came up to us and told us that her and her brother are both very interested and serious about thru-hiking in the next few years. That was more than we could have expected. If anything, we wanted to inspire the students to get out and enjoy nature. In Maine, we are fortunate to live in a state that has so many versatile outdoors activities to partake in year-round. Hiking, kayaking, skiing, hunting, four-wheeling, snowshoeing, biking, ice fishing, and even surfing are just some of the things there are to do here throughout the year. And I specifically made it a point to tell the kids that they are very lucky to live so close to Katahdin, no doubt the most beautiful mountain on the entire Appalachian Trail. We felt pretty good about presenting to the high school students, but we weren’t sure how the middle school students would react to our talk. Would they even be interested in what we had to say? We had only about 35 minutes to tell them about our thru-hike and leave time for questions. When our video elicited laughs at certain sections, I knew we were beginning to capture their attention. And by the time we finished talking on stage and asked for questions, more than twenty hands shot up at once in the audience of 10-14 year olds. And after almost ten minutes, there were twenty more hands up in the air, if not more dying for their questions to be answered. The principal was kind enough to let the older kids stay for another ten minutes and ask more questions. And I think we had about 25 kids try on Miles’ pack. Their reactions were awesome. Half of them remarked that it wasn’t as heavy as they thought it would be and the others reacted with, “Oh my god, this is so heavy!” I loved helping the kids try on the pack which for some, was more than half their size. Being able to connect to a crowd of 10-14 year olds that we weren’t so sure about beforehand was so satisfying. All of the kids asked really great questions and I can still their eager faces as they raised their hands as high as they could, hoping that we would call on them. And when there was only time for a few more questions, you could see the desperation in their expressions as they hoped that they would have their question answered. I had about a week off during Christmas, which was my first “vacation” since coming home from the trail. It was so nice to go home for a week and spend time with my parents. My sisters also came home, so everyone was up in Bucksport together. And then the ice came. And then we lost power for three days. The day before we lost power, my mom and I had bought a ton of food for the holidays. We had dinner plans all set and the ingredients for our once-a-year waffle breakfast on Christmas morning. When it was clear that we would be out of power until Wednesday or Thursday of that week, we stored food in the cold snow banks on the deck and savored the precious daylight that was afforded to us during the shortest days of the year. Since we live in town, we were fortunate enough to have running water, which some people we knew were without. We ate Christmas Eve dinner at my sister’s fiancé’s parent’s house in town and came home to watch It’s A Wonderful Life with just enough battery on my mom’s laptop. On Christmas morning, my dad was able to cook our entire breakfast on the grill. It was in the single digits, but he stuck it out and cooked pancakes (in lieu of waffles), eggs, and bacon. The orange juice and fruit had stayed cold outside the night before and with my parents, my two older sisters, their significant others, my nephew Louie, Miles, and I in the house, all the food was devoured. We enjoyed opening our gifts around the tree that morning, everyone together, the power outage not affecting our time together as a family. 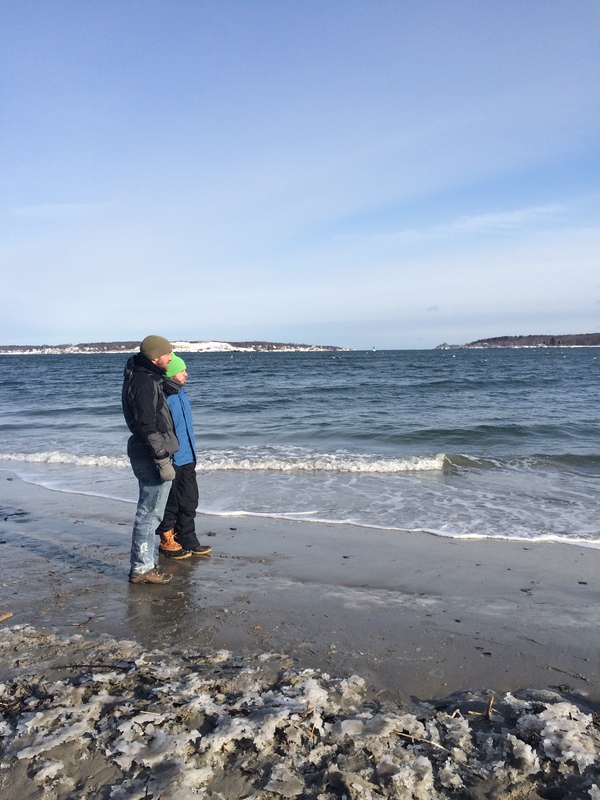 We explored Willard Beach and Spring Point in the snow, post-holing down to the beach and sliding across the ice near the lighthouse. We had dinner with another thru-hiking friend who lives in Maine, Prometheus, and Miles and Teflon went skiing at Sunday River as well. I was bummed I couldn’t go skiing, but I had a photo shoot. And when you have a photo shoot booked in January, you don’t pass that up. Miles and I are planning a trip to Sugarloaf soon, so I’m really looking forward to that. It was awesome to hang with Teflon and Prometheus. I think it’s time for us to plan a trip to visit Teflon in Colorado now. It’s only the courteous thing to do, right? Miles and Teflon at Willard Beach. And now I must address my lack of blogging. I figured out my problem. I know why I’m not writing as much. I know this because I went on a 2 hour snowshoeing expedition in the Great Pond Mountain Wildlands in Orland while I was home. Not to mention the two beautiful snowshoeing hikes with my friend Hayley and her family in Witherle Woods in Castine. We set out near sunset, snowshoed to the end of the peninsula looking out on Penobscot Bay, the Camden hills, and Islesboro. It was absolutely beautiful with the deep colors of the setting sun strewn across sky and sea. We made a loop back to her house, our headlamps guiding us through the blank slate of the snowy woods, the wet snow falling in front of us. It was simply perfect. 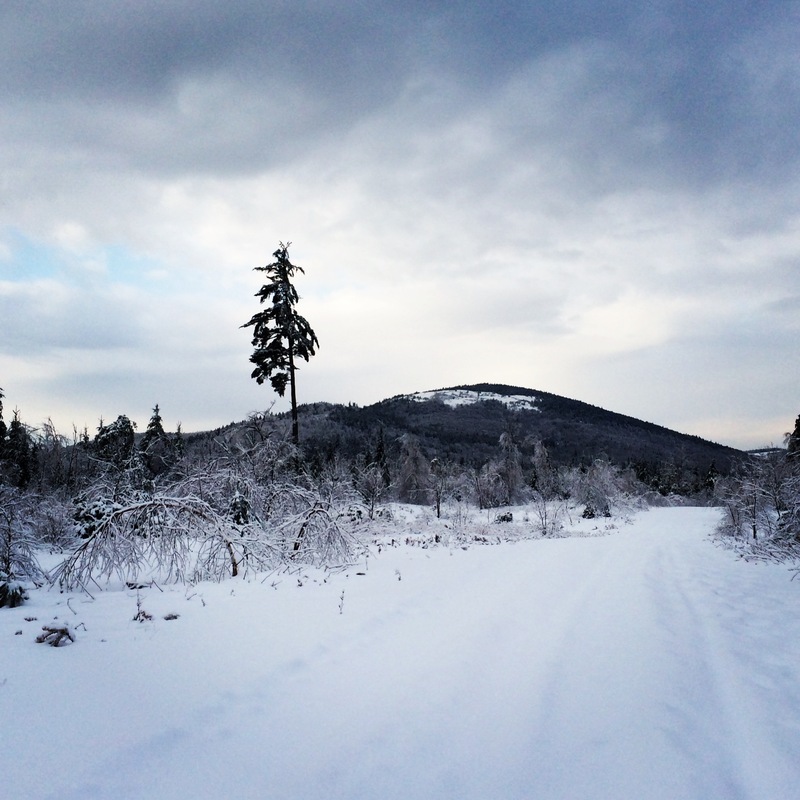 After a fresh coat of snow, I set out to hike up Great Pond Mountain in my snowshoes. Central Maine Power trucks were blocking the road getting power back up to area residents, so I decided to head to the other side of the conservation land in East Orland. 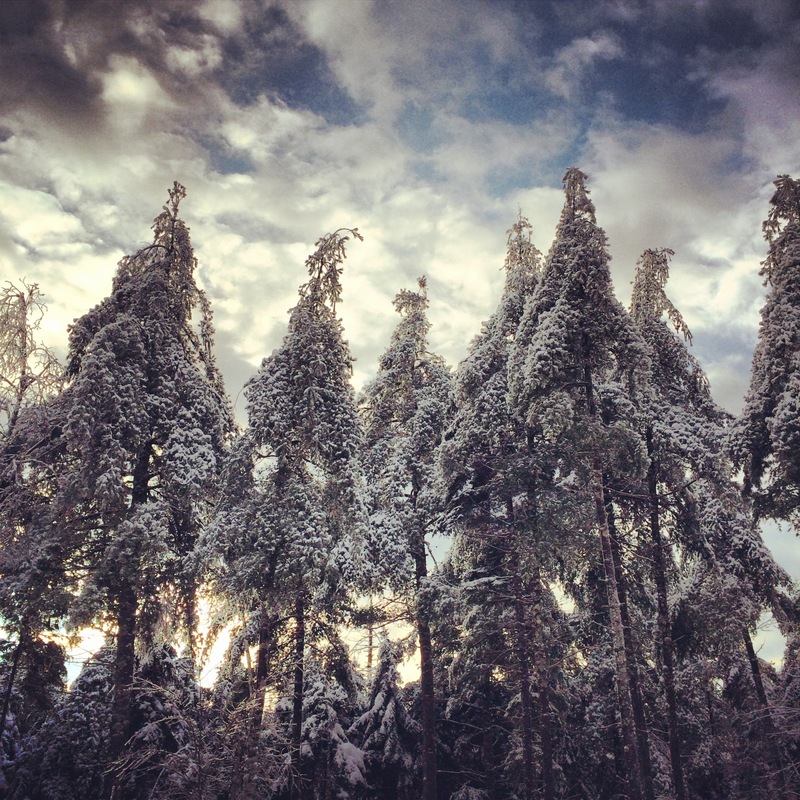 This was after the ice storm, so my trek was not an easy one. 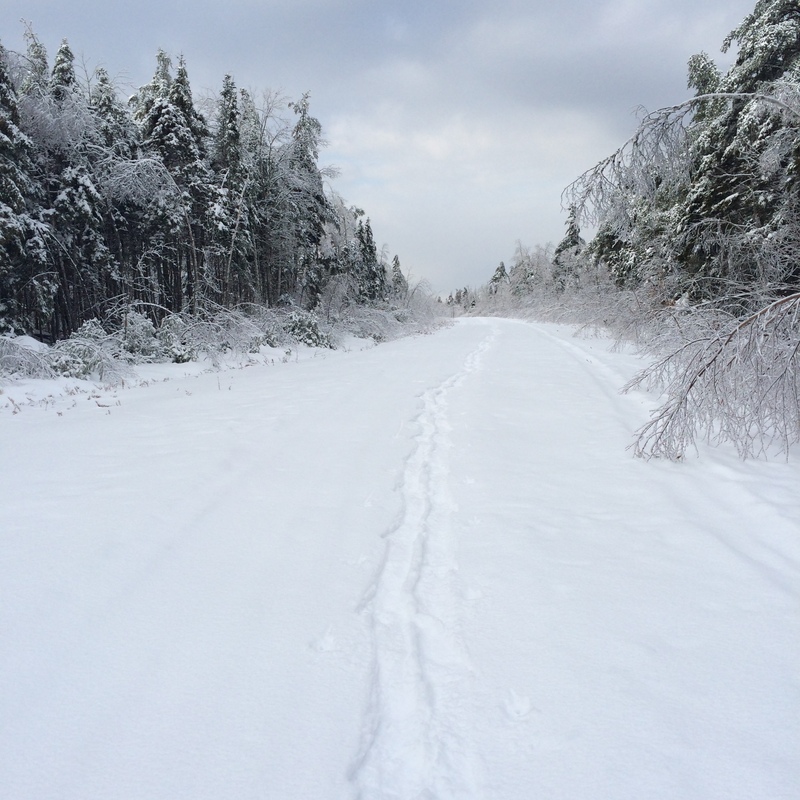 More often than not, I was ducking under weighted down trees and breaking through the ice that lay beneath the new coat of snow that blanketed the trail. I was the first one out, but I was up for the challenge. I saw several moose tracks and had a clear view to Great Pond Mountain from the access road halfway through my hike. 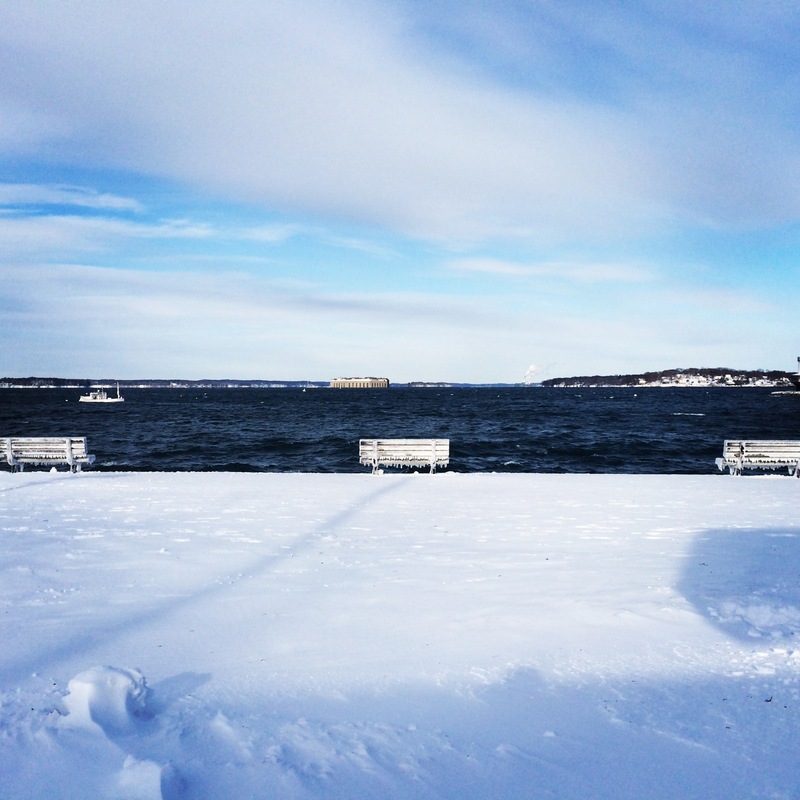 Maine is even more beautiful in the winter. This is proof. As I trekked through the woods, I began to think about thru-hiking and naturally for me, writing. I thought about how I would write about my time in the woods that day, how I would describe the trail, the trees, the smell, the sound of the small stream that I leapt across. My inspiration was returning to me. I think that after writing for five months I thought I could just continue to keep up with that task easily. But that hasn’t happened. I’m busy. I work, I go to the gym, I’m extremely invested in improving all aspects of my sister and I’s photography studio, Tandem Studios, and then I’m tired. I read A Clash of Kings and go to bed. But as a thru-hiker, I should know more than anyone that being busy is really no excuse. I could have said that I was too busy to leave my job for five months and hike the Appalachian Trail. A lot of people say that. But we did thru-hike and didn’t let “things” get in the way of that dream. I actually get upset with myself every night when I look up at the clock to see that it’s 1:00 AM and I haven’t written on my blog. I feel like I’m letting myself down and all of my dedicated readers out there. I have two major goals for the year. One is what I mentioned above: to work on making Tandem Studios a sustainable (and awesome) business. I love my job and I think it fits perfectly with my hiking needs in the future. It will be paramount however that I focus a lot of my energy into building a strong, solid business and client base. I was not a business major, but I’m enjoying learning about the business and marketing side of things. My other major goal this year is to begin the stages of writing a book about our thru-hike. I’m not sure exactly what that entails, but that’s what I’m working on finding out. I have no dreams of literary fame whatsoever, especially with so many books already out there on thru-hiking the AT. Writing a complete and cohesive story of our thru-hike is an idea that I have been gravitating towards for so long now, that I know it’s what I really want to do. It will be a long process, as will building up my business, but I’m prepared to be patient and remain dedicated to the two things that I want to do most. It will take equal parts sitting in front of a computer as it will being outdoors. But, hopefully the percentage weighs more towards the outdoor world than the digital world. And so I know the secret now. It took me five months to discover the answer to my lack of motivation. I need to walk. And then I need to write. The pictures are great. Thanks. How your relationship grew, changed, was tested would greatly enhance your story in your book. And contrasting how you and Miles reacted, appreciated coped differently. It will be more interesting if its about both of you. People love the human aspect. So nice to hear from you! I have been checking the blog weekly for new stuff…Great to be surprised this morning. Happy your school experience was so positive. I am sure the kids ate up the story of your adventure. Miles called recently and asked for our address…I just texted it to Lindsey’s cell phone. Glad you guys are well! You’re an inspiration to the young (and old, as well). Miles will have much to offer as a teacher and your determination to make your joint business venture a success is commendable! Happy new year! Great to hear from you! I hope your visions will come true. Carpe diem! You only live once 😉 !!!!!! You keep writing and I’ll keep reading! I think it’s great that you are planning to write a book. I will buy a copy! I hpe all your vision will come true! You only live once 😉 !!!! I’m so glad to see you writing again! I love to read the blog! Write the book! Welcome back! I’m in love with your story about the students! What a great way to reach a neglected audience. Happy New Year…keep writing!! Great update. Wonderful photographs! I took a look at your studio site and think the photos were amazing. I’m sure that your clients were very pleased with the outcome of their sessions. Best of luck, and keeping walking and writing. Your blog is great, I was considering going NOBO sometime in March and was trying to figure WordPress out. Do you need a host like hostgator? Can you recomend any good resources that explain WP simply. Thank you, congratulations on your journey.